Turf-N-Tree is your source for all landscape services, including landscape design, patio design, tree care, and installation and construction of all kinds of landscape elements. Choose Turf-N-Tree for reasonably priced landscape services completed on time by courteous, well-trained and well-equipped crews. Turf-N-Tree serves both residential and commercial customers with landscape installation and maintenance services. 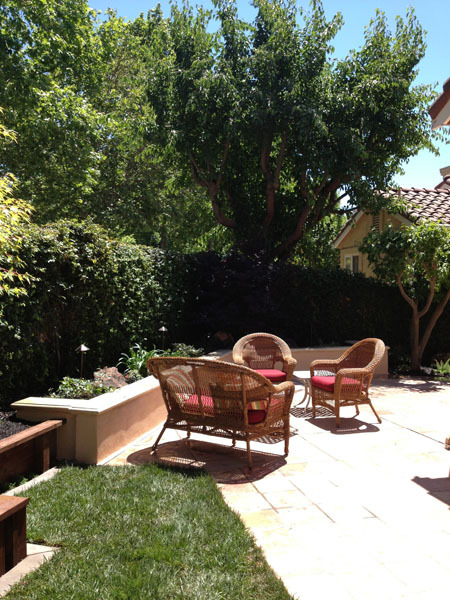 We are dually licensed by the State of California for Landscape Construction and Tree Care. Our staff includes a certified arborist and a landscape design specialist. As a full-service landscape company, we have the skilled crews and equipment needed to complete any landscape project—without using subcontractors. Whether you have a mature yard that needs an update or an empty space that needs a pleasing design concept and complete installation, we can provide a low-maintenance landscape solution that you will enjoy for many years. Call on us for any landscaping installation, renovation, or maintenance project, including those involving drainage, irrigation, water features, masonry, rock elements, retaining walls, walkways, lighting, custom trellises, concrete staining, or outdoor faux painting.